Built by Robert McLeish for £30,000 the Rivoli was designed by Messrs [Frank] Richardson and Wood and opened on 18 May 1921. The theatre’s orchestra was under the direction of Cecil Bois. During a trip to America in 1928 McLeish saw firsthand the development of sound cinema and organised the purchase of sound equipment from R.C.A., thus ensuring that his cinemas, the Rivoli included, were among the first to be able to exhibit “talkies” in 1929. As with many suburban cinemas during the 1910s and 1920s the Rivoli’s entertainment programs sometimes included variety entertainers between films. The opening night, for example, featured singer Walter Kirby and accompanist Natalie Dawson. 1: This venue should not to be confused with the Rivoli Theatre at 200 Camberwell Road. Also built and originally owned by McLeish, it opened in 1940 and in the 1960s focused on presenting art-house movies. It was converted into a twin cinema in 1968 and an eight screen multiplex in 1999. 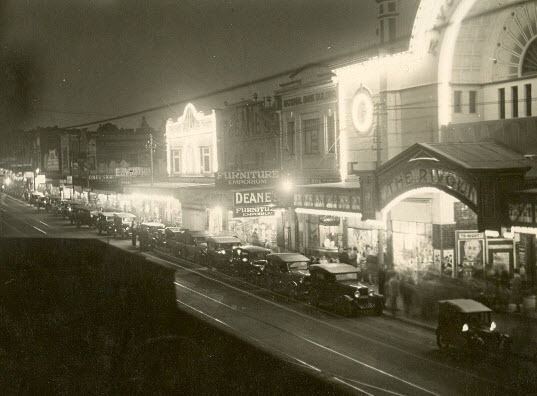 2: The Cinema and Theatre Historical Society of Australia Inc’s special feature page devoted to the second Rivoli Cinema incorrectly records the 1921-1940 cinema as being located 570 Burke Road. Image source: Camberwell Historical Society. Image citation details for entries without expanded biographies are noted at the bottom of the overview. All other image details are provided in the expanded PDF biographies. For information concerning copyright issues see “Copyright” attachment in the AVTA “About” page.